In our house, chaos and competing needs ensue when it’s time to craft. My kindergarten girl loves to sink into a project for hours, while my nine-year old boy struggles with perfectionism and impatience. Meanwhile, this mama skips anything veering too far toward tacky. I’m always on the lookout for ideas that can go long or end quickly. They must be simple enough for Willa to do independently, yet intriguing enough to hold her interest, while also remaining accessible as a just-right challenge for Kai without overwhelming him. 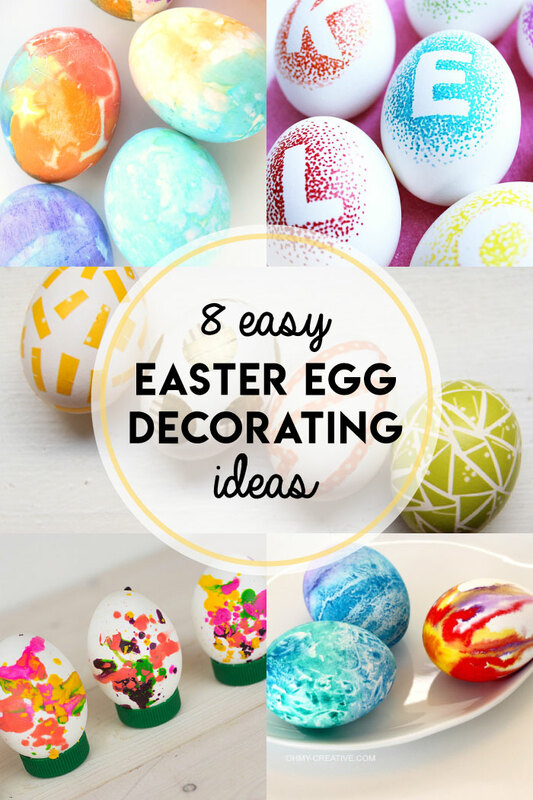 Happily, I’ve found 8 easy and completely fabulous Easter Egg Ideas that fit the bill this year, and I thought you might appreciate them, too -- especially if you’re like me and headed toward yet another year of last-minute egg decorating! My kids love anything involving tissue paper color transfer. Autumn’s Tissue Paper Easter Eggs bring all the vibrant color of traditional dye minus the mess, stress, and tricky maneuvering. Can’t wait to make these with my kids this week! Sharpies rule. Artzy Creations combines my favorite markers with letter stickers and pointillism to personalize eggs for everyone in the family. Learn to make these monogrammed eggs right here. Mommypotamus provides a complete guide to dyeing Easter eggs naturally with everyday ingredients. Heather has done extensive testing and gives all the deets on which produce to use for the most vibrant, consistent colors. Melted crayons make me happy -- especially when they’re transformed into colorful abstract art. These melted crayon eggs from The Nerd’s Wife are easy enough for toddlers and preschoolers to create and as a bonus, they’ll use up all those random crayon bits and pieces that accumulate so quickly. Washi Tape awesomeness! The ease of making Chelsea’s DIY Washi Tape Easter Eggs is matched only by their elegance. This idea will be perfect for my daughter, who has been known to blow through more than ten rolls of tape in a single weekend of creating. Want to amp up the glam on #5? Nail polish + glitter washi tape = genius. Kate’s Easter Eggs could intrigue even a few tweens who think they’re too cool for basic dying. Susan of Oh My! Creative offers a few easy techniques she learned from her artist father to create stunning watercolor eggs. She makes crackle, speckle, and color bleed simple and accessible in this post. These brilliant tie-dye-without-the-dye eggs require just a few supplies that most of us already have around the house. And they’re easy enough that even the littlest family members can make something beautiful. Did you love this roundup? We'd love it if you'd spread the love and pin this post!